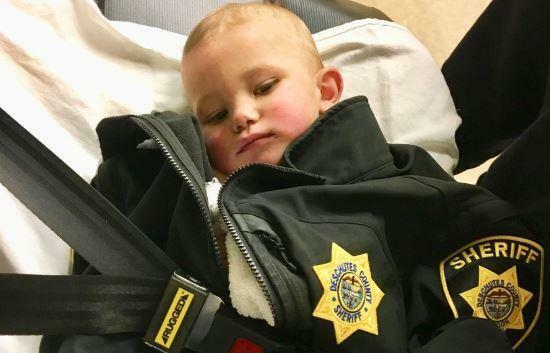 BEND, Oregon -- Police in central Oregon found a missing toddler naked and covered in dirt after his father, who was allegedly on drugs, left him in the woods, according to police and news reports. The father, 25-year-old Ohio man Brandon Blouin, has been charged with criminal mistreatment, child neglect, endangering the welfare of a child and assault after the six-hour search Thursday in Deschutes County, the sheriff's office there says. Deschutes County deputies responded to a home south of Bend around 6:17 a.m. Thursday after a 911 caller said a man had come out of the woods and was on his property asking for law enforcement. The man, Blouin, told deputies he and an 18-year-old woman and their one-year-old son Bradley Michael Thomas had been staying in a vehicle in the forest. The woman at some point walked away, leaving Blouin to care for Bradley. Blouin said he waited for her to return, and then took the child with him to look for her. During his search through the wooded area, Blouin said he put the boy down in the forest and left him. The sheriff's office said Blouin "is believed to have been under the influence of a controlled substance when he made the choice to set him down and walk away." The sheriff's office launched a massive rescue operation with neighboring jurisdictions and described a "race against time" to find the boy using resources including ground and horseback searchers, drones and helicopters with thermal image sensors. The boy was found just after noon, naked and lying in dirt, about a mile from the family's car. He was taken to a hospital for evaluation. Detective Doug Jackson, who found the child along with a sheriff's sergeant, told the Oregonian he was among about 50 people searching for the boy. He said he noticed Blouin's trail shoes left a distinctive heel imprint and followed his footprints through sagebrush, eventually finding the boy sleeping in dirt and pine cones near a fence. Jackson told the paper he let out a sigh of relief and picked up the child, who was warm. The sheriff's sergeant took of his jacket and wrapped the child in it, the paper reports. The sheriff's office published a photo on their Facebook page of the boy in the jacket. "I don't think we could've gotten a much bigger win than this," Jackson told the paper. "When you have a needle in a haystack situation like this, it could go a number of a different ways. It was very much a team effort, and I'm just thankful that we found the kiddo." Jackson said the boy appeared unharmed. Police later said doctors found an injury they believed the child suffered in Blouin's care that led to the assault charge. Jackson said both the child's parents appeared to be under the influence of methamphetamine. Police say Blouin is in police custody St. Charles Medical Center in Bend. It's not known whether he has a lawyer. The 18-year-old mother is not facing charges. The child is currently in state custody. Jackson told the paper he has visited him several times at the hospital, and said he is eating and smiling. "He is doing incredibly well considering what he's been through," Jackson said.